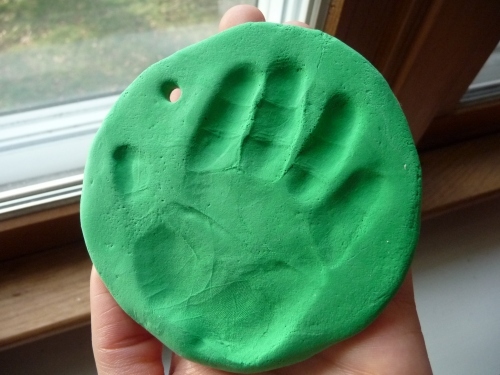 Make your own ornaments or other fun projects using natural clay playdough. Once you make the mixture using one of the recipes below, form the CLAY into shapes, let it dry. For large items or particular shapes you can make the insides hollow by using cartons, cans,styrofoam or an air filled balloons on the inside, then forming your shapes around it! 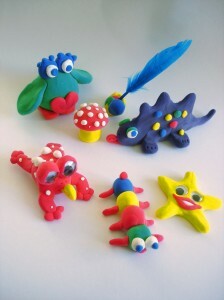 Make your own clay or playdough instead of buying Playdoh! 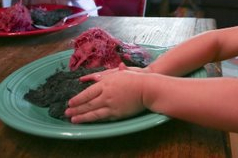 The recipes are safe enough for kids to put their hands in their mouths while playing. They are not healthy snacks, but they are safe if swallowed. Items made with each one can be allowed to air dry and then painted. In a saucepan, mix the baking soda with the cornstarch, then add the cold water. Add food coloring. Cook the mixture over a medium flame, stirring constantly. When the clay is the consistency of moist mashed potatoes, turn off the heat. Dump the clay onto a plate, and cover it with a damp cloth. When the clay is cool to the touch, it's ready to use. Store it in a Ziplock bag or a container in the refrigerator. After keeping the clay in the refrigerator, allow the clay to reach room temperature before using it. Mix the flour, salt, and cream of tartar in a pot. Add the water, oil, and food coloring. Cook over medium heat while stirring constantly. When the mixture forms a ball in the center of the pot, turn off the stove and let it cool. Take it out of the pot knead it several times. Store in a Ziplock bag or airtight container in the fridge. Mix the flour and salt. Slowly add the water, and knead to make smooth dough. Add the oil and food coloring and knead until the color is mixed in. No cooking is needed. Put salt and 2/3 cup water into a pan and bring it to a boil. Add 2/3 cup of water to the cornstarch with 2/3 cup water and stir well. Add the salted water to this mixture and knead it into a clay. Store in a Ziplock bag or an airtight container in the refrigerator. Learn how to make paper for many thing from scrap paper and discards and recycle. Exclusive Planetpals Three Patterns! 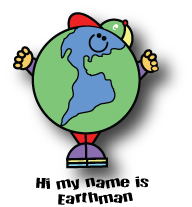 Make the Planetpal, the world, or a Santa Ornament in Paper Mache. Why not try making Paper Mache PLANETPALS?